After lots of deciding on which headphones to go for finally I decided to go for HD218. I have tested it with iPod Touch and HP DV5 notebook. 1) Comfort: The ear caps are really comfortable. The design is similar to high-end Bose headphones. I tried wearing these for like hours and it didn’t hurt my ears, the fit was perfect. 2) Bass: The bass is soft. I didn’t get to try HD228 but the 218 offers a very natural bass. 3) Foldable Construction: The ear caps rotate making it easier to stuff it in your bag while travelling. 4) Noise Cancellation: Yes, these do a bit of noise cancellation too. Once you start music you will hear very less (almost no) noise. 5) Cable Length (1.4m): Most of them say that the length is small, but the primary purpose of the headphones is for portable media players. Considering this I think the length is appropriate. 6) Overall Sound Quality: The soft bass and treble make up for a good sound. Also the volume level is pretty high. 1) Treble: Its way high. Even though this helps in giving crisp clear sound, I wished that the treble would have been a bit low. Anyways I think this is a trademark sound for Senheiser. If you don’t like much treble consider Sony or Bose. 2) Bass: It’s a bit low. Anyways I think for the bass freaks Senheiser has taken care of by giving an option HD228. HD218 provide a very descent sound at a very low cost. If you are looking for the same, you can go ahead and grab these. If you need a higher bass go for HD228. 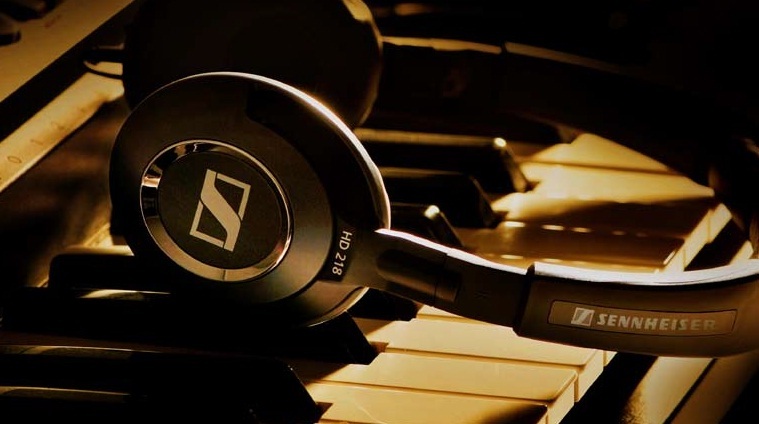 The most important thing, if you don’t like much treble in the music, will recommend going for Sony, Skullcandy or Bose. 1) Senheiser HD228: Higher cost version of HD218, offering powerful bass with same design. High cost kept me away from these. 2) Senheiser HD222: The reviews were really good for these, but being fully closed and considering portability I rejected this. 3) SkullCancy Uprock/Lowrider: Didn’t get to try this, so avoided to take the risk. Also the reviews said that the bass was not that good. 4) Sony MDR-XD200: If you don’t mind the size, these provide a good sound at reasonable price. 5) Bose: If you don’t mind spending lots of money and your aim is for the best sound, nothing beats the Bose quality. I got up early in the morning at 0400 Hrs and I knew that today was going to be special. So with great enthusiasm I tied the lace of my Adidas shoes and grabbed my iPod (Loyal Companions) and left out. The combination of these was supposed to keep me going for the day. It was still dark. I had to walk a nice 2.5 Km to catch the bus which was supposed to come at 0540 Hrs. Unsurprisingly the bus was late which came at around 0600 Hrs. So then the journey started, picking up others on the route. Soon the morning sun came out and there was some light. Slowly the bus left out the city with the buildings initially becoming scarce and then only smaller ones were seen with the green fields increasing on the other hand. The bus was taking me to a route (NH4) which I have like travelled for past one and a half year more than fifty times, but had never travelled it during daytime. I was travelling a long distance during daytime after years. We had breakfast in the bus itself, and then made a short stop for tea. we travelled on NH4 till 1100 and then took a left(instead of my usual right to village). We were in Karad. Our destination was Vita some 40 Kms from here. On the way I found a signboard to Bijapur. It said 100 km. This was the place where I spent some of my early childhood days. So we reached Vita, got the message that the second bus was broken down, so instead of two volunteers in a class it would be one. It didn’t actually matter to me much. Having taken such sessions for three classes previously, I was pretty much confident this time. The only anxiety was about which class I would be getting. I always prefer higher classes, since they understand bit easily and pay more attention. This time a Engineering College was chosen, where students from nearby school would be attending it. We were as always welcomed like celebrities in the college. Each one of us was given a rose by an engineering student. As I entered the class, there was a pindrop silence. Well I expected atleast a Good Morning Sir or something like that. Anyways, I kept my bag and Rose on the chair. I took a nervous look at the class, took a deep breath and started. Immediately I noticed that the class consisted only of girls. No doubt there was so much of silence. The uniform they wore was red Salwar Kameez. Unlike my other rural visits these students were looking much well-mannered and well-dressed. I started with my brief introduction and the sponsors intro(Infosys). I had to speak in Marathi. There are some advantages in taking such sessions in Marathi. The students are less frightened of us and it helps to reduce the barrier between the teacher and the student very quickly. I decided to start with some ice-breaker questions. As to what is Computer etc. No one answered anything. Given a class of girls and an unknown person(ME) asking questions, that was expected. I went on ahead explaining about computers. An electronic device used to do mathematical calculations accurately and quickly. Followed were some examples of bank, library, shops etc. I explained them exactly how using computers in such fields is not only time saving but also efficient. I explained the parts of computers viz. Input and Output devices. Now I asked questions and the students answered. I started to feel much more confident. The task here was not to give bookish definitions to the students, but to make them understand and tell them exactly how much fun it is to understand and use computers. I then started to explain the idea of Internet. And as I explained it I could see the anxiety in the eyes of the students. Mostly they were thinking like “Whoa, A thing like this also exists.” I asked them if they have heard anything like google.com or rediff.com or yahoo.com and the answer was no. So it was another task to explain them this. Whenver I ask a student to answer my question, I ask him/her to say his name aloud to the class. This is a great morale booster. As the students started answering, I noticed those were the ones who came out of their comfort zones and started asking me questions. In short MISSION ACCOMPLISHED!!! I answered some queries of the stuedents. Even though it was late for lunch break they were still listning with patience. The lunch was great. Actually the arrangement was pretty good too. So after lunch, we were supposed to give students the hands on session. The agenda was Microsoft Word, Excel, Paint etc. Its really bad to see the expression of the students who dont get a chance to do a hands on session. So I have requested the organizing committee that next time we have two PC in a class instead of one. When you see students asking for a chance you can’t deny them too. At the end of the day, the feedback from the students goes as follows.. Almost 40+ Thank You, 30+ You teach really well, 10+ Do come to our school once. I was almost at tears with the last statement. Such a day never I will forget. Nor the faces of the students. In this world of ever increasing Wi-Fi devices, I think this post will be very helpful. 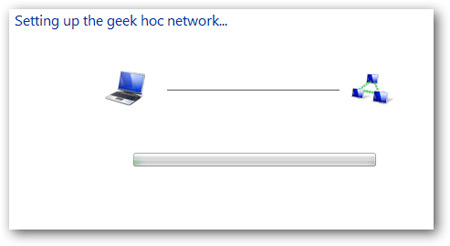 This will work only if u have an icon consisting of two PCs to connect to internet like in case of “BSNL Broadband”. 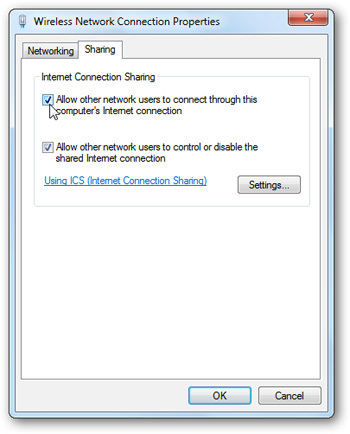 Right click the icon u use to connect to net, BSNL in my case -> Properties -> Sharing -> Check allow other network users to connect bla bla . 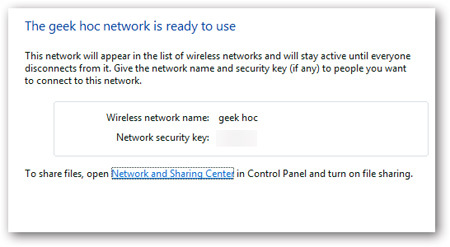 and select wireless network connection from the drop down list (if applicable) . Click apply. Had spent some time to discover the second method. Before trying anything, you should make sure the wireless card is on. 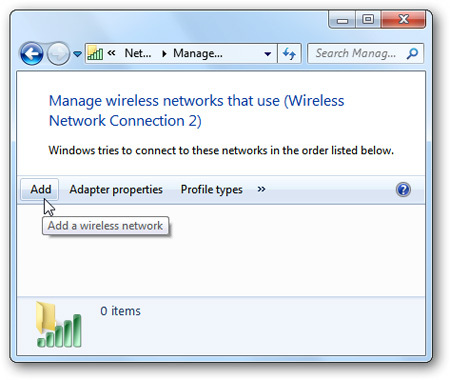 If your wireless card is on, you should see an icon like this one in your task bar. 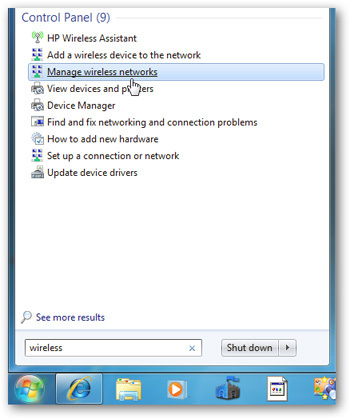 First of all you need to create the wireless network where your computer will appear as an HotSpot. Once you see this dialog, press the button “Properties”. You’ll see the following dialog. 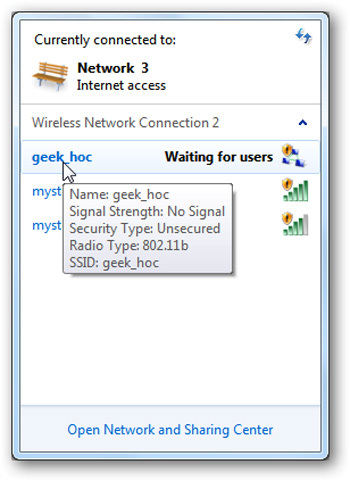 Enter a name for the network (SSID), e.g. MMN. 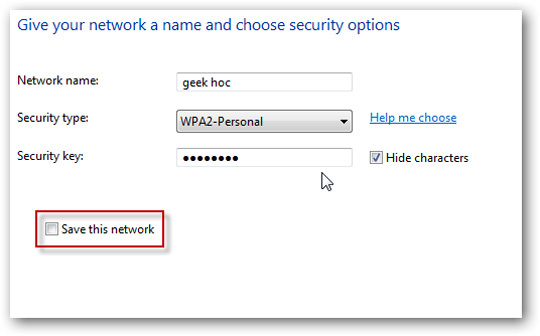 Protect your network with encription via the WEP key. 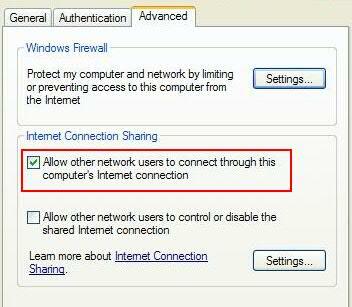 Make sure it is you, and not the computer to provide the Network key. Enter your Network key, it must be 10 figures exadecimal number, e.g. “abcdeabcde”. press the button “OK” to close it. 3. Start -> Run -> Type “ncpa.cpl” in the text-box and press enter. 5. 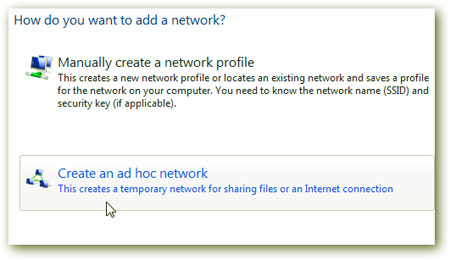 Select the earlier created network in step 2 on your mobile device and you are ready to go. I have tried to make the post as simple as possible. If you are still facing any issues I will be happy to hear them in the comments section. It’s been two years I have opened a twitter account. But seriously I had joined to keep myself updated about MTV India. At that time I had just completed my BE degree in electronics engineering and had a lot of spare time. Instead of watching the stupid serials on star plus, Sony tv etc I had only this option left. I found myself comfortable first using orkut. That was my first social network account where I took my updates seriously. I had an account on Facebook too but at that time it was so complicated and very few of my friends existed there so naturally I had tok stick to Orkut. But then suddenly things changed. Just as if they were selling gold on Facebook people started flocking to it. And then just as it happens in any social network world, you do not decide which service to join or not, it’s what your network decides. One of my friend was still stuck to orkut when he knew all his friends too were now on Facebook. Soon he realized his mistake and did what others did, joined Facebook. The major difference in Facebook were the variety of useless applications which people found interesting. So no matter how good orkut was getting, it didn’t stop my friends to get to Facebook. So the previous scene everything about scraps now it was about the wall. One amazing fact is that the number of actual farmers is smaller than the number of people playing FarmVille(An online game on Facebook where people look after their virtual farms). Twitter was totally out of picture till now. It was when I saw that most of big personalities/companies were on twitter I got interested in it. And I guessed that this will be the future. Twitter is not a social network site as most people think rather it’s an micro blogging site. I had to literally watch a short tutorial on how to use twitter. The interface at that time was so minimal, RT hastags etc seemed like keywords then. It’s now that the interface is improved and twitter itself gives you an link for retweeting, replying etc. Getting on to twitter I didn’t feel comfortable at first. According to me, at that time; it was just another social network with everything stripped off except the status updates. But things changed drastically over last some time especially when I got an iPod touch. And finally over the long run its the simplest interface which wins. The app for iPod touch for twitter made more sense to use twitter here instead of the more complicated Facebook. And finally it’s the updates which finally matter to you of any person. Another thing what I like about twitter is it’s 140 character limit. I don’t understand why people have to put in very long status updates and most of such are left unread by a person like me. The only problem in moving here is again the same, very few people have joined twitter and most importantly only half of them are active. But still now I prefer twitter and slowly and steadily I am decreasing my presence on Facebook. The only reason that I am still on Facebook is that some of my best friends are still there and from what seems is that they are not going to join twitter soon. What do you think, who will end up having the largest traffic… Facebook, Orkut, Twitter or the newly launched Google plus… you are free to share ur view in the comments section. Wave gives us an peek of how e-mail will look like if it had been invented now. instead of individual message sent to each other, wave has a single object which can be shared with each other.User can open a wave read, edit and reply to it. You have privacy settings too. when you first start wave you will simply forget that you are in a browser viewing a page. A very cool User Interface. Anyone can start a new ‘wave’ and type in it, with an inbuilt spell checker. Once you create the wave it appears on the screen with the person you are sharing it. the person can reply right inside the wave so no need of that messy reply messages. Also whats more cooler is as the person types and if you are online you can see the message typed letter by letter from the other person. this helps you to spend all the time either reading or writing that speeds up your conversation. Also there is a check box right below to hide the live type. Even you can reply at the middle of the message. To share the wave with more users all you have to do is drag and drop a person from your contacts list. Then they too get to send replies and if they happen to be online all of them can just edit, read and reply at the same time, you can change the privacy settings too if you dont want your wave to be edited. Replies can also be made private to a particular users. You may be thinking after lots of edits and replies the wave will get somewhat unorganised to look at however there is a timeline so that you can view the original message and then play it so that you can just see how the replies came in by. this is helpful esp for new users you have shared your wave with. Sharing Images is lot easier, just drag and drop your images in your browser thats it. you can add images to a wave itself, and all those with whom you have shared the images can edit the captions simultaneously, all changes visible letter by letter at same time. With API you can do lot of things. For eg. share your wave with a blog so that the blog gets updated as you update your wave. If some one replies to a blog you get the same reply in Google Wave and also if some one replies in Google wave it appears in the blog replies. You can create a wave in orkut itself using embedded API. With online language conversion you just type in letter by letter and it will get converted to any language you select. Suppose a user understands french you type in english, it will get converted to french, when the user types in french you will get it converted in English. In what appears to be a challenge to Google Earth and Wikimapia, the Space Applications Centre (SAC) of ISRO has come up with ‘Bhuvan’, bringing India’s name into the limelight yet again. Bhuvan, which literally means ‘earth’, is a web-based tool like Google Earth, but it promises better 3-D satellite imagery of India than what is currently being offered by other Virtual Globe software. Moreover, it brings you a host of India-specific features such as weather information and even administrative boundaries of all states and districts. Bhuvan is equally capable of offering images of the globe, but the best resolution area is India, at least for the time being. “Bhuvan will be able to give you an image from only 10 meters away”, an ISRO spokesman said; which means in the Indian subcontinent even a commuter moving on the road can be easily spotted. Bhuvan uses images taken at least a year ago by ISRO’s seven remote-sensing satellites in orbit including Cartosat-1 and Cartosat-2. 1. Bhuvan allows users to access, explore and visualize 2D and 3D image data along with rich thematic information on soil, wasteland, water resources etc in the Indian subcontinent. 2. It displays multi-resolution, multi-sensor, multi-temporal image data. 3. Users can superpose administrative boundaries of choice on images as required. 4. It allows visualization of AWS (Automatic Weather Stations) data in a graphic view and use tabular weather data of user choice. 14. The Bhuvan portal is designed to run on slow Internet connections. Thus, Bhuvan represents, in essence, the whole India on your computer. The next version of Bhuvan is expected to be called Bhuvan ChandraBhumi, which will feature both earth and moon in resolution up to 347 m maximum in near side and 432 m far side which is taken by Chandrayaan. The Bhuvan project demonstrates the country’s expertise in both information and space technology. The Bhuvan can be downloaded from http://bhuvan.nrsc.gov.in/. It’s because while Mac is the good egg, Windows is the same chick that’s been trying to break out of its shell since 1985. Even its latest version, Windows 7 (W7) appears a few steps behind the robust (Apple’s) Mac operating system (OS). It may be glitzy and boast of novel features, but what W7 offers in 2009, Mac OS users have taken it for granted for a long time. It might surprise those who swear by market trends where Windows is the clear winner (the Windows to Mac market share ratio is about 8:2). But we – Mac users – have no qualms about it. We are a small, happy family, which takes pride in quality and doesn’t shout from the rooftops about innovations. Why, how many of you know that OS X 10.6 (aka Snow Leopard), the latest from Mac, was launched on August 28, 2009, without making any noise or tall claims? Maybe because it’s not so much about new wallpapers, interface, colour themes, security options and desktop gadgets. Instead, Snow Leopard is all about the ‘routine’ changes that your system and mine need: increased speed and more space (maybe Microsoft will consider it in W17, probably 10 years later). Don’t get me wrong. I am not anti-Microsoft; I spend almost the same time fretting over both OSs. That’s what helps me understand the difference better. My conclusion is that it isn’t Apple’s extraordinariness that gives it an edge over Windows; Mac is better because Windows’ instability gives it the reference point. The latter learns from its mistakes and comes out with a less-erratic product each time; the former creates new errors in its laboratories, solves them and makes innovation available for public use. Windows 7, then, is a face-saver for a company that failed in its pioneering effort with Vista; Snow Leopard, like its predecessor Leopard, continues the tradition of surging towards an improved future. Well this is what I read today from a reporter on yahoo news. definitely mac is worth trying. The greatest advantage here will be freedom from lot of viruses but the compromise will be a limited number of softwares. Win on the other hand has a large number of softwares. Ask any hacker which is easier to crack an Windows or mac they will surely say Windows is too hard to crack lot of security in it, what makes it more vurnable to virus attacks is its popularity. Very less people use Mac as compared to Windows. Naturally Windows becomes an easier target.